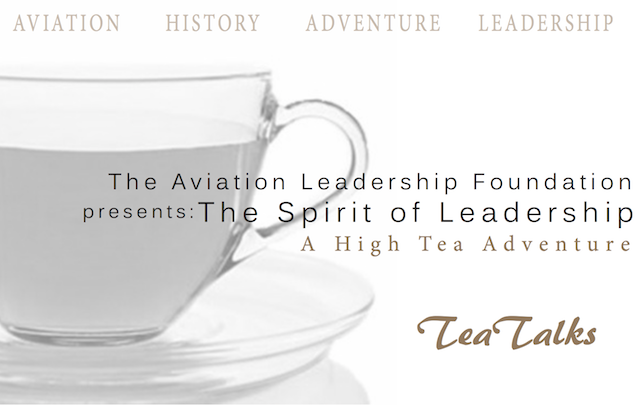 The Women in Aviation Sea to Sky Chapter — which promotes the passion and potential of Women in Aviation through advocacy, education and advancement — is presenting The Spirit of Leadership: A High Tea Adventure along with the Aviation Leadership Foundation. This speaker series is a part of the Aviation Leadership Foundation’s “Tea Talks” program which is inspired by TEDTalks. The event will take place next week in Vancouver where special guests will lead intriguing and insightful sessions at the Rosewood Hotel Georgia. The tea will feature speakers including Jeff Glickman. Mr. Glickman will take participants on a journey of his search for the remains of Amelia Earhart and her aircraft. Our other speakers will engage the audience in their own stories of courage, adventure, and leadership. An opportunity for questions and mingling will follow the presentations. With a vintage aviation theme and all the makings of a proper English afternoon tea, a journey through time will tantalize the taste buds with the stories and spirit of leadership. Other speakers include Barbara Ross-Denroche, President, Chair and Co-Founder of The Refinery Leadership Partners Inc, and a member of global organizations including Women Presidents Organization, International Women’s Forum and the Forum for Women Entrepreneurs BC. The event takes place from 2:30pm to 4:30pm (registration and networking starts at 1:30pm) on Tuesday, July 30, 2013. Following the event, attendees are welcome to the Georgia Hotel Rooftop Terrace Reflections Lounge for cocktails and networking. This will be the perfect afternoon escape for all people who love adventure, high tea, aviation, leadership and/or history. With a focus on adventure, all guests will have the opportunity to connect with other professionals who share a passion for leadership. Tickets are currently available online. Follow the Aviation Leadership Foundation on Twitter, and the tag #TeaTalks, for updates about their events. I will draw one winner at random from all entries at 5:00pm on Sunday, July 28, 2013. Update The winner is Dayna Wilson! Sounds like a great event! I would love to hear Barb speak! She is such a great leader! Oh my gosh, I am so fascinated by the Amelia Earhart story. This would be so cool to attend. Have been intrigued (and inspired!!!!) by the Amelia Earhart story my whole life…would LOVE to attend. Up, up and away! This would be an interesting event to attend! I’m very interested in the Amelia Earhart mystery. I’d really enjoy this!! Sounds like an inspiring event! I wish there would be more women in aviation careers. This is fascinating stuff. I will be downtown on that day and would love to attend. Would love to attend this event. Fascinating and inspiring speakers no doubt.